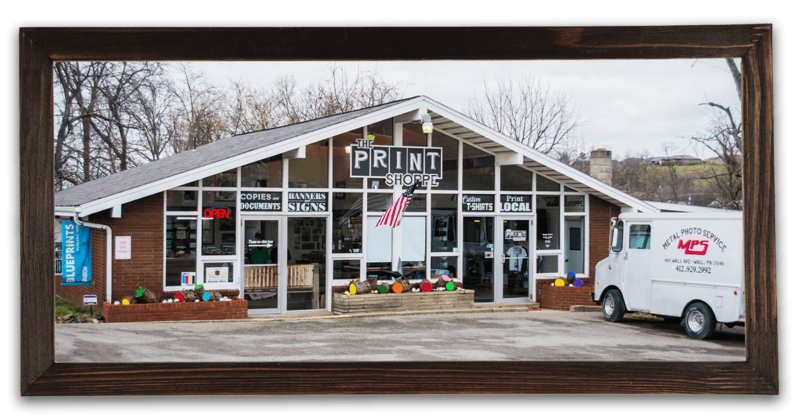 Print Shoppe | Printing, Custom Shirts, & Much More! We print on almost anything! your number one source for all things printed! We’re dedicated to giving you the very best customized printed materials, with a focus on dependability, customer service and uniqueness. manufacturing printing company located in Wall, PA.
fresh ideas and resources for all of your printing needs. our objective is to provide our customers with the highest quality products at a fair price. We only have one planet to live on, so it's never too late to start being Eco-conscious. From our family to yours, cherish the world that gives you life, and have a Happy Earth Day! Happy Easter from all of us at The Print Shoppe. Missing someone who's serving our country? Miss them no more, with a custom life size photo cutout! Contact us today for pricing. Thanks to Shaun at Steel City News for the follow up story. Presentation of the Fish Fries of Westmoreland County 2019 Champion Plaque at Claridge Volunteer Fire Department in Penn Township. Crazy that was 25 years ago. The results are in and the 2019 Fish Fry Champion is Claridge Volunteer Fire Department Penn Twp. Co. 3. Thank you to everyone that participated in the poll and purchased the fundraising t-shirts. We were able to donate over $2500 to the local organizations through our t-shirt sales this season. company located in Wall, PA.
With our staff’s 35 + years of experience in the printing industry, they bring a wealth of knowledge, fresh ideas and resources for all of your printing needs. Whether it’s helping you create a unique item or creating distinctive items for our online store, our objective is to provide our customers with the highest quality products at a fair price.